Do your kids love animals? Then use Animal Fun Zone HD to help teach them the names of animals! Animal Fun Zone HD uses voiceovers, animation and special effects to help your children learn animal names. Your kids will have fun watching the animals bounce across the screen. If they touch the wrong animal, a voiceover tells them the name of the animal that they touched. If they touch the correct animal, cool special effects like fireworks, stars, and balloons let them know that they got it right! LITE VERSION contains 4 animals, regular version contains OVER 25 cute animated animals! Watch the animals bounce onto the screen and off the screen. Voice recordings of all animal names, so your child can learn the names of all the animals. Specially designed for kids, no fancy menus to confuse them or distract them. Level of difficulty adapts to your child's progress. Cool special effects appear whenever the correct animal is selected. Please note: Lite version contains 4 animals. 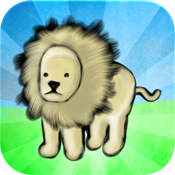 Regular version contains over 25 animals, 3 levels of difficulty and way more fun! Any and all feedback is greatly appreciated. All feedback is useful to make the app better for you and for your kids!